Nelson Mandela was the first black President of South Africa and was an instrumental figure in ending apartheid. After his term as president, Nelson Mandela went on to become an advocate for social and human rights organizations. His involvement in politics started when the National Party, which supported the apartheid policy of racial segregation, won the elections. Mandela joined the African National Congress party and began actively campaigning against the National Party’s policies using nonviolent methods, as inspired by Mahatma Gandhi. However, as time went on and he was no closer to ending apartheid, he changed his philosophy and began organizing more guerrilla warfare-like sabotage tactics to further his cause. After being on the run for 17 months, Mandela was finally captured and imprisoned in 1962. His imprisonment lasted an incredible 27 years. In the late 1980s, there was mounting pressure from the international and local community for the South African government to release Mandela. He was finally released on February 11th, 1990. South Africa’s first multiracial elections, in which full enfranchisement was granted, were held on April 27th, 1994. Mandela’s party won the election, and he became the first black president of South Africa. As president, Mandela presided over the transition from minority rule and apartheid, winning international respect for his advocacy of national and international reconciliation. Mandela retired from the presidency in June 1999 and devoted himself to social activism. 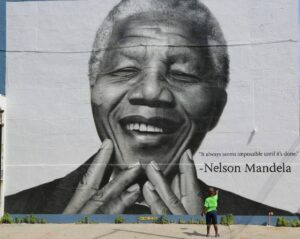 Mandela envisioned a South Africa without apartheid, where every man would be free and equal in the eyes of the nation. It was this vision that sustained him through his darkest days in prison. We’re often taught that wanting success means wanting a big house, a fancy car, and a luxurious lifestyle. And there’s nothing wrong with that. But when the going gets tough, you’ll give up easily because the desire for material possessions won’t be strong enough to sustain you. However, if your vision is to have a positive impact on the world, you can draw on that to persevere, even when faced with the toughest challenges. Your journey to achieving your vision won’t be a walk in the park. You’re going to face many obstacles along the way and individuals who oppose your progress. Before Mandela successfully abolished apartheid in South Africa, he faced opposition from individuals and organizations all over the world. During the early years of his anti-apartheid movement, he was imprisoned and declared a terrorist by the United States. Mandela spent 27 years in prison before he was elected President of South Africa. Even faced with such a huge setback, he never gave up on his vision. You will face setbacks in your life too. Don’t give up and keep pressing on. Do not get discouraged at the first obstacle! Fight for what you believe in, and remember your purpose every time you feel like giving up. No matter how ideal your vision, it means change for some people. Not everyone is willing to change because it is uncomfortable and sometimes outright painful. Don’t expect everyone to rally behind you. Have conviction in your goals and stay committed to them. Your steadfastness will influence and inspire others to join you over time. Mandela is a great example of how leadership is not tied to a position. Winning the South African presidency formalized his position as a leader and enlarged the scope of his influence and impact. However, Mandela held a considerable amount of influence even before his presidency and continued to use his political and social capital after he retired. His ability to unite people and galvanize support for the abolishment of the apartheid, even while he was imprisoned, shows that leadership can thrive without formal authority. After he had retired from his presidency, Mandela continued to use his influence in a positive way through supporting social causes. You don’t need a formal title to display leadership qualities. Being a leader is about having the capability to influence and motivate others to move towards a goal, and this can be done at any level. Regardless of whether you are currently leading a team, cultivate your skills and look for opportunities to showcase your leadership potential when working with others. Someone will notice the positive impact you’re having on the organization!